MaryPat Christie holds a 100-year library card. 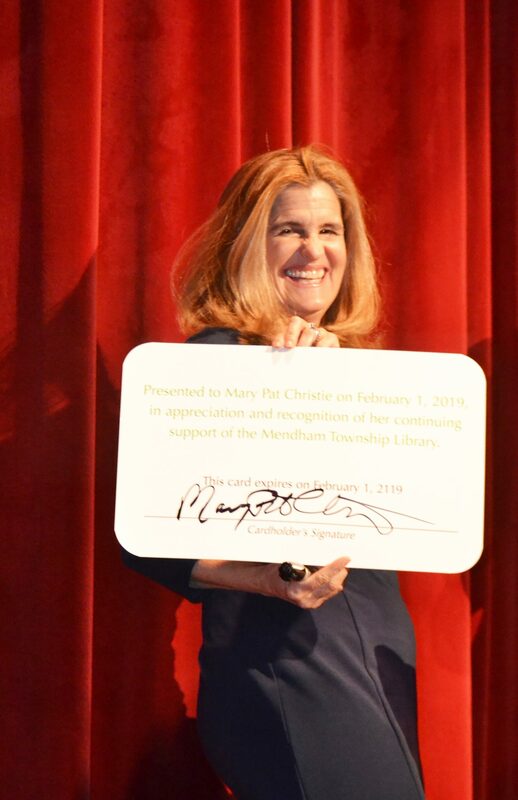 The Mendham Township library issued the Christies the cards and gave them board of trustee pins after the book signing. 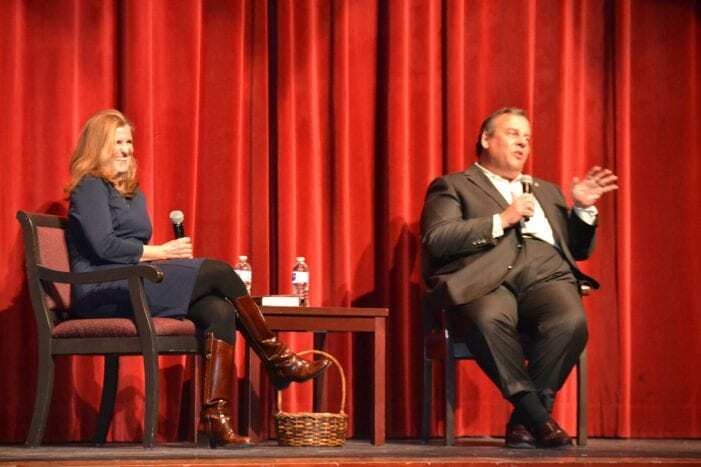 MaryPat and Chris Christie on the stage at West Morris Mendham Regional High School. Gov. 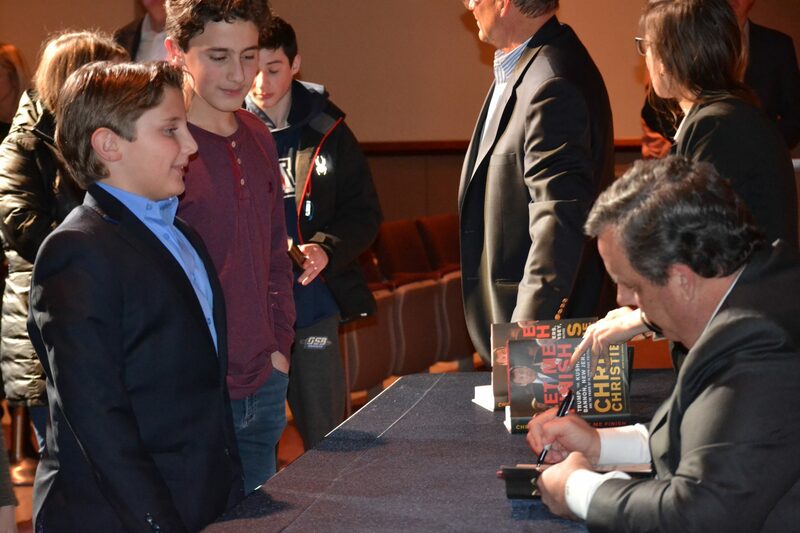 Chris Christie signs copies of his book for his nephews. Gov. 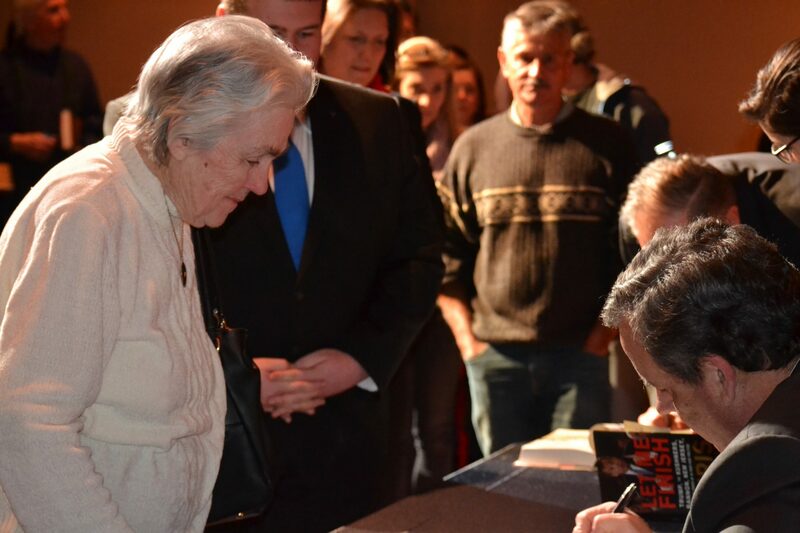 Chris Christie signs his book for his Aunt Ruth. MENDHAM TWP. – The demographics of the auditorium at West Morris Mendham Regional High School skewed a little older than the usual assembly on Friday, Feb. 1, as residents and people from far out of the area gathered to hear former Gov. Chris Christie talk about his new book. Copies of Let Me Finish: Trump, the Kushner’s, Bannon, New Jersey, and the Power of In-Your-Face Politics clutched tightly, more than 400 people packed the room. His aunt, sister, youngest child and several nephews and cousins were among them, but most were fans. Several Mendham residents knew the Christie’s well. MaryPat Christie, who interviewed her husband for the book talk, noted the family moved to Mendham in 1992. Peter Colford, president of the Mendham Township Library Board of Trustees, said the Christies have been great supporters of the library. “I know MaryPat well, our boys go to Delbarton together,” said Renata Paulius of Franklin Lakes who drove down from Bergen County for the event. Christie didn’t disappoint. One audience member queried why he would still engage with President Donald Trump after being fired from the transition team. told me grudges are a waste of useful energy. If the President calls and asks you to help, you do. The country matters more than hurt feelings.” O’Keefe, who was a mayor of Denville as well as Freeholder and Freeholder director, died in 2011. Christie said the name of the book refers to the fact he isn’t finished serving his country, although he’s not sure in what capacity he will continue. Another audience question addressed Christie’s famous love for the Dallas Cowboys and noted this was not always popular among the Giants fans in North Jersey or the Eagles fans in South Jersey. He noted he once had to remain in the stadium waiting for the Philadelphia police to clear people away from his car after a Cowboys-Eagles game. He mentioned a confrontation with New York Football Giants owner John Mara after Mara saw an autographed Roger Staubach football in the Governor’s office. Christie reminded Mara his team practices and plays in New Jersey and told him if he changed the name to the New Jersey Giants, he might root for them. Norma Delepine who teaches at Oak Knoll School of the Holy Child in Summit said her classes started holding round tables around the time of the 2016 election and are continuing. “The Christie years still come up in discussion,” she said, adding because the Trump administration is so colorful (she used air quotes) the girls at the school pay attention. She said she couldn’t wait to bring the book to her students and talk to them about Christie’s presentation. Naoma Welk of the library Board of Trustees said the fund raiser nearly sold out. Peter Colford, president of the board, said the library is part of the fabric of the community and its fundraisers are generously supported by the people of Mendham Township.